What Is Asclera® (pronounced a skler ah)? Asclera® is a sclerosing agent that is injected into the vein. It works by damaging the endothelium, the cells lining the inside of blood vessels. This causes blood platelets to attach to the lining of the vessels; eventually, cellular debris and platelets cause the blood vessel to clot. 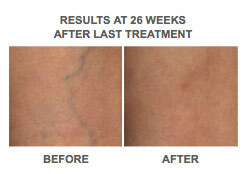 Over time, the clotted vein will be replaced with tissue. 1 At 12 and 26 weeks after last injection patients received the digital images of their treatment area taken at baseline and were asked to rate their satisfaction with their treatment using a verbal rating scale, where 1 = very unsatisfied, 2 = somewhat unsatisfied, 3 = slightly satisfied, 4 = satisfied, and 5 = very satisfied. What should I avoid after receiving an Asclera® Injection? Are there any possible side effects to Asclera® treatments? In rare cases, formation of small “burns” or ulcers form, usually due to leakage of Asclera® into the skin. They heal in time, but may leave a scar. • Visit the official Asclera Website. • View the official BEFORE and AFTER Asclera Photo Gallery.